We will start driving to Aphrodisias for your tour. The ancient city of Aphrodisias is one of the most important archaeological sites of the Greek and Roman periods in Turkey. Aphrodisias lies in the Maeander River basin, in a fertile valley 100 miles southeast of the port of Izmir. Famous for its sanctuary of Aphrodite, the city's patron goddess, Aphrodisias enjoyed a long and prosperous existence from the first century B.C. through the sixth century A.D. Today, many of the city's ancient monuments remain standing, and excavations have unearthed numerous fine marble statues and other artifacts. The great beauty and extraordinary preservation of this site combine to bring the civic culture of the Graeco-Roman world vividly to life. 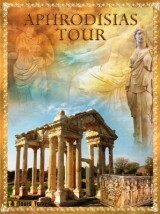 Regular & Private Aphrodisias tours available.